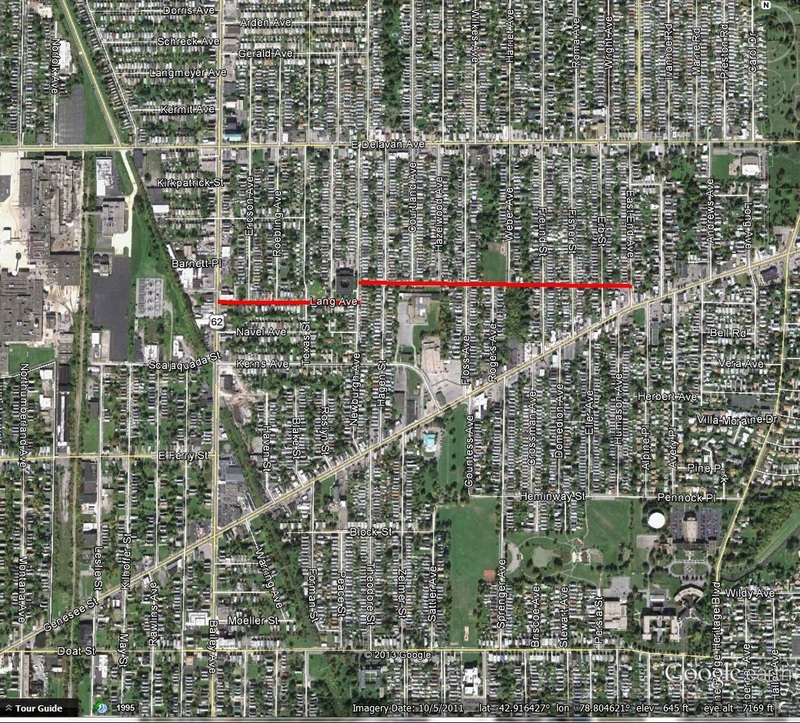 Lang Avenue is located between Bailey Avenue and East End Avenue, between Genesee Street and Delavan Avenue, in the Schiller Park neighborhood of the East Side of Buffalo. Portions of the street are paved in brick. Lang Avenue is named after Gerhard Lang, owner of one of Buffalo’s premiere and largest breweries at the turn of the 19th Century, the Gerhard Lang Brewery. Gerhard Lang was born in Germany in 1835. He came to Buffalo in 1848 at the age of 14 with his father, Jacob Lang. Jacob Lang was a butcher and Gerhard learned English while working in the butcher shop. Around 1862, he assumed control of the Born brewery at the corner of Genesee and Jefferson streets. Mr. Lang married Born’s daughter and assumed control of the brewery after a few years of marriage. In 1875, he purchased the a site at Jefferson and Best Streets to expand his facilities. He toured other breweries across the country to determine the best design for his facility. The Gerhard Lang Brewery was located on the entire block bounded by Jefferson, Best, Berlin and Dodge Streets was the largest brewery in the State outside of New York City. Berlin Street was renamed Pershing after WWI (in 1920). The Lang Brewery was called “the Palace Brewery”, because it was built with a typical Victorian opulence. Once the new brewery was built, Mr. Lang used the old brewery at Jefferson and Genesee Street for bottling works and malting house. The annual capacity of the Gerhard Lang Brewery was over 300,000 barrels. Lang’s beer was known all over the country for its excellence in quality, purity and wholesomeness. By 1887, the brewery employed 110 men and distributed to Virginia, Boston, Baltimore, Washington, Philadelphia and New York City. In addition to the brewery, Mr. Lang served as Alderman of the Sixth Ward and was a Trustee in the Western Savings Bank. Mr. Lang was a member at St. Louis Roman Catholic Church and donated one of the stain glass windows to the church. 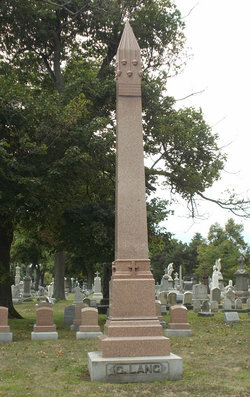 Gerhard Lang died in 1892 and is buried in the United German and French Cemetery in Cheektowaga. After his death, Edwin G.S. Miller took over the brewery, along with Jacob Lang, Gerhard’s son. Before Prohibition, the Lang Brewery also owned many saloons that sold its brews. It is said that Lang’s owned more saloons and beer gardens than anyone in Buffalo, as many as 80 at one point. Before the automobile, horses were used to transport beer around town. The brewery kept 500 horses in a stable in Fort Erie to distribute Lang’s beer. During Prohibition, Lang’s produced dairy and soda products. There was Lang’s Dairy & Creamery, Lang’s Bakery and products like “Hyan-Dry” brand soda and “Liberty Brew”, a malt extract beverage. After Prohibition, Lang’s was one of the first to start back up. However, the market had changed, and the new regulations and taxes made it difficult for local breweries to stay competitive. The Gerhard Lang Brewery shut down in January of 1949 after 109 years in business. Gerhardt Street, located on a portion of where the Brewery was located was likely also named after Gerhard Lang, although I was not able to find any specifics linking this together. History of the City of Buffalo and Erie County: With Illustrations and Biographical Sketches of some of its Prominent Men and Pioneers. Edited by H. Perry Smith, D. Mason & Co Publishers, Syracuse NY 1884.